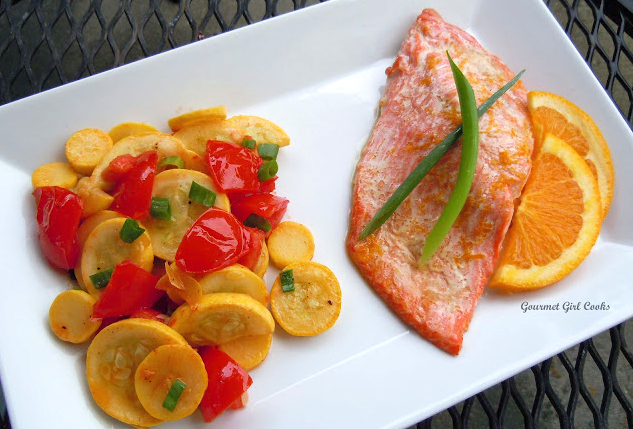 This evening I decided to cook my fresh wild Copper River Sockeye Salmon for dinner. I wanted to change it up just a little bit since hubby is getting a little tired of eating it so frequently! ;-) It was so simple and quick to make. I cut the large fillet into 4 individual fillets and placed them skin side down on a foil covered baking pan. I melted a few tablespoons of butter and added about 1 teaspoon of fresh orange zest and the juice of half of a large orange (probably about 3 to 4 tablespoons of juice), 1 tablespoon of Tamari sauce (similar to soy sauce and wheat free) and a dash of cayenne. I brushed the orange flavored butter on the salmon fillets and popped them into a 450 degree F oven for 5 minutes and then reduced the heat to 425 degrees for another 7 minutes (total cooking time is 12 minutes). After removing from the oven, I immediately covered them tightly with foil and let sit for 10 minutes to allow them to gently complete their cooking. While the salmon was roasting, I sliced about 4 small yellow squash and quartered and seeded 3 Campari tomatoes and set them aside. 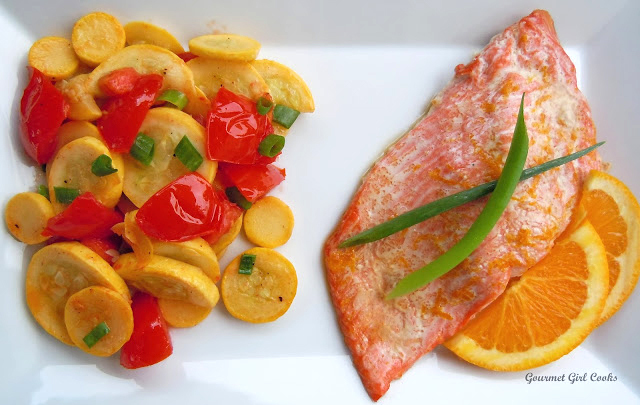 After removing the salmon from the oven to sit, I lightly sauteed the squash in butter and added the tomatoes toward the end to heat through and then sprinkled with a little sea salt and a few sliced green onion tops. The salmon was very delicate and moist with a nice understated hint of orange flavor that didn't take away from the flavor of the fresh salmon. It was simple and quick and the best part is that I still have 2 extra pieces left to enjoy for my lunch the next couple days! I snapped a few photos for you to see below. Enjoy! We finally made it to Costco and got the fresh salmon. I'm sure it was Copper River, but it wasn't labeled as such. It looked the part and the price was right for it. We grilled it on the "barbie" yesterday with butter & lemon and it was perfect ... just like Copper River Red should be. The orange butter recipe looks wonderful. I'm going to make that soon. This is such a fancy recipe. It is very luscious-looking. It makes me drool.